Eric Doyle & Mark Kelly from Synge Street, ‘Young Scientist’s of the YearYes, it’s that time of year again when thousands of students and visitors descend on Dublin's RDS for the four-day 2012 BT Young Scientist & Technology Exhibition. 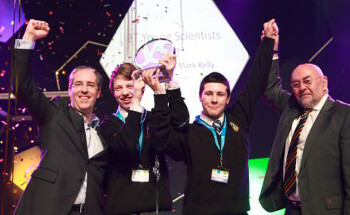 The winners of this year's BT Young Scientist Exhibition are from Synge Street CBS in Dublin.17-year-olds Eric Doyle and Mark Kelly won with their project entitled "Simulation accuracy in the gravitational many-body problem". Now in its 48th year, the exhibition, which took place January 11th-14th, aims to give secondary students a once-in-a-lifetime opportunity to showcase what they do in the area of scientific investigation, innovation and discovery – all on a national stage. With both government and industry stressing the importance of science this year’s event took on more importance than ever in encouraging students to devote themselves seriously to the subject. In all, 550 student projects took part in the competition and were themselves chosen from a far greater number of applications submitted by schools across the country. Special prizes were up for grabs from high-tech multinational such as Google, IBM and HP which feel a responsibility and a duty to support and reward stand-out projects in certain areas of research. But the title of Young Scientist/s of the Year is by far the most coveted prize. It goes to what the judges consider the best-presented piece of research and comes with a nice cheque of €5,000 as well as a trophy. The winner/s also gets the opportunity to represent Ireland at the EU Contest for Young Scientists which last year was won by our entrant, Alexander Amini. In addition to the students’ exhibitions there was a range of science and technology exhibits on show. These included a scientific circus called ‘Little Big Top’, a 3D journey through the cosmos from the W5 interactive discovery centre based in Belfast.